As I’ve alluded to the last couple of days, 2009, in my opinion, was a year for great genre films, not necessarily straightforward dramas. For instance, this time of year I’d normally be busy planning how I was going to get to see all the major Oscar contenders in the next month. This year, my January clean-up list is small and I can’t even say for sure the ones on it will get nominated. As a DVD collector, I’m fairly pleased that 2009 was a genre year. I tend not buy many dramas on DVD and instead stick with more re-watchable titles in comedy, action and science fiction. Considering the best films of the year came out over the summer for the most part—in my opinion – this winter in particular has been about picking up the hot DVDs like Star Trek, The Hangover and District 9, even though I usually prefer to wait or buy used. So to send 2009 out, I’ve taken a look at the year’s highest-grossing films, its best reviewed films and my own personal opinions, and spun up some interesting assertions that I think you’ll find put a proper label on this year. I’ve broken it down into sections so if you don’t have time, you can read what interests you most. To get a sense of what critics liked this year, I looked at Rotten Tomatoes and this is what I found: of the 100 best-reviewed films of 2009 (that each received at least 100 reviews, which was a total of 35), 21 of those films were in a genre other than drama. Of the remaining 14, six could be considered other genres: Inglourious Basterds, The Hurt Locker, A Serious Man, Up in the Air, Moon and Sin Nombre. True, I haven’t stacked that up against previous years, but 60 – 75 percent of the best-reviewed films being genre films? That’s a lot. The Top 5 best-reviewed genre films on Rotten Tomatoes with at least 100 reviews? Pixar’s Up comes in first, followed by rock documentary Anvil! The Story of Anvil, then The Hurt Locker, educational doc The Cove and lastly, the satirical comedy In the Loop. Animation was the best genre in 2009. 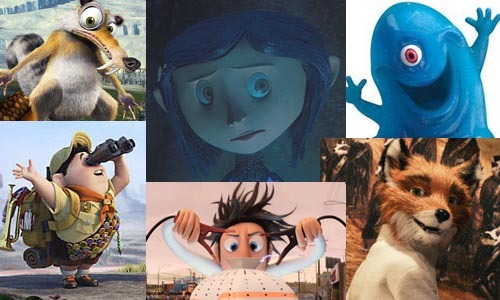 Up led the way for a five-nominee expansion of the Academy’s Best Animated Feature category. Normally you’d look at the Academy’s three every year and frown at a couple of the names up there. Not so in 2009, a banner year for animation and 2009’s most successful genre critically and monetarily. It started in February when Coraline became the first undisputed critical success of 2009. A stop motion and 3D trip into a dark, Beetlejuice-esque fantasy world, Coraline was an imaginative, albeit a bit scary, family-focused tale – certainly not traditional. Then came the first box office smash of 2009, Dreamworks’ Monsters vs. Aliens. Although there were a couple January films that went on to do well, “MvA” took in nearly $60 million in its first weekend last March and is currently the No. 8 highest-grossing film of 2008 with $198 M.
Obviously that was only the beginning. There was Up in May followed by another box-office smash, Ice Age: Dawn of the Dinosaurs, which ranks No. 2 behind Harry Potter 6 in the worldwide box office this year with $883 million. Hayao Miyazaki’s Ponyo capped off the summer, another success for the beloved anime director. The third Ice Age wasn’t a huge critics’ favorite, however. This fall’s Cloudy with a Chance of Meatballs, Wes Anderson’s stop-motion Fantastic Mr. Fox and Disney’s 2D hand-drawn The Princess and the Frog all found favor with critics even if the latter two didn’t make as much bank. Robert Zemeckis/Disney’s A Christmas Carol also had a great late year run. Heck, even the Toy Story / Toy Story 2 3D double feature held its own this year. So what does it all mean? With the success of 3D, animation is a medium where Hollywood has made the most progress. We’ve seen some breathtaking CGI this decade and 2009 was a celebration of that – of sorts. With such incredible animation, these films have suddenly become better, captivating us on beauty alone in many cases. In turn, we’ve seen bigger risks – by Pixar, namely – in terms of storytelling. Animation has always been associated with kids. Will that be true in another ten years? Will animation continue to rival live action in terms of quality, not just money? If Up can finish No. 1 with the critics and No. 5 at the world box office despite being deemed “less marketable,” the ceiling is high for this medium and 2009 was just the beginning. The 1960s became the new retro decade in 2009. With AMC’s drama Mad Men one of the biggest hits on television, there’s no denying that in these times, there’s something vastly appealing about the 1960s. In film, we saw this in the Coen brothers’ A Serious Man and Lone Scherfig’s An Education. We’re also seeing it in one of the smaller films out now, A Single Man, created by Gucci’s Tom Ford. If Tom Ford is into the ‘60s, then the ‘60s have to be in style. As for why, in addition to the fashion side and the classiness of the decade, in these tough economic times I think we can easily relate to the ‘60s lifestyle of being stuck in a picture-perfect “let’s get married and have kids because that’s just what you do” situation. These films have shown in their protagonists how great a conflict there can be between conformity and personal desire. Right now, we all have to bear down and do what it takes to survive the economic climate, even if it means sacrificing something we really want/wanted to do and people in that time were definitely dealing with that – having affairs but staying in marriages – the whole bit. Ultimately, what’s so appealing is that drinking, smoking and socializing lifestyle that we’re so far removed from and find no longer acceptable or healthy. It’s like a dream, that age, despite being just 50 years ago. It’s almost a fairytale of sorts going back to a time where class and reputation was still so important. You get that in the 1920s too, but the difference is relaxed morals via the sexual revolution, etc., which is infinitely more identifiable. 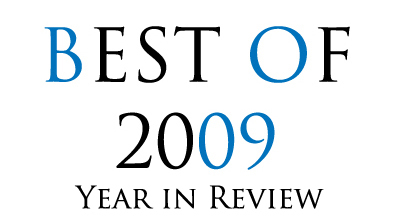 2009 was the year of the science-fiction comeback and the genre’s best year in the decade. Two original sci-fi movies and a rebooted franchise marked a year where science fiction was king of all that wasn’t animation in terms of blockbusters. In a year where superhero movies took a breather aside from a poorly received X-Men Origins: Wolverine and the mixed-reaction Watchmen, films such as Star Trek, District 9 and Avatar came to the rescue instead. In terms of business, source-material films like Transformers: Revenge of the Fallen, The Twilight Saga: New Moon and Harry Potter and the Half-Blood Prince did incredibly well – in fact, better than any of those big three sci-fi films – but only the last one found any critical favor. Science fiction stepped up and took all the accolades while still comparing favorably in terms of box-office take. Star Trek and Avatar currently sit at No. 6 and 7 on the domestic box office list. But more importantly was the quality. On Rotten Tomatoes, Star Trek received 94%, District 9 a 90% and 83% for Avatar. There was original storytelling going on with great characters and great visuals. Terminator Salvation, the genre’s other big release of the year, was accused of focusing too much on the action and as a result made less. Audiences respond to good science fiction when it’s given imagination and heart. That’s what these three films had in common. To show how big this year was for science fiction, Children of Men, V for Vendetta and WALL*E are the only films considered science fiction since The Matrix in 1999 to make imdb’s Top 250. All three of this year’s sci-fi hits are on that list. In a decade dominated by fantasy book adaptations and superhero movies, it’s refreshing to see original science-fiction resurface. This was clearly the biggest sci-fi year of the decade. Sandra Bullock, Ryan Reynolds and Gerard Butler officially became Hollywood’s newest most bankable stars in 2009. Sandra Bullock has always been seen as a RomCom icon, but she’s never known success like she has in 2009. The Blind Side has earned her a Golden Globe nomination and her popularity alone might convince voters of an Oscar nod to boost ratings. “Blind Side” has been the biggest surprise of 2009 (No. 10 in domestic total gross) and she’s the only face you can associate with it. Jump to The Proposal, the highest-grossing romantic comedy of 2009 both domestically and abroad despite a 43% on Rotten Tomatoes. What else do you attribute those numbers to? Riding on that success was Ryan Reynolds. Former funnyman and college-movie star of Van Wilder and Waiting … Reynolds was all immature comedy until he was cast in 2008 romantic comedy Definitely, Maybe. Then he landed this part. Now, he can pretty much get whatever he wants and he has. After playing the supporting character Deadpool in May’s X-Men Origins: Wolverine, Fox suddenly announced Deadpool would get his own movie (huh?) and Warner Bros. chose him as the star of 2011’s Green Lantern, the superhero film that’s supposed to help DC Comics reach the level of Marvel’s superheroes on the big screen. That’s a lot of faith. As for King Leonidas himself, Gerard Butler has suddenly done the impossible: become an icon for action films and romantic comedies. Maybe he doesn’t have the guaranteed box office pull: The Ugly Truth and Law Abiding Citizen both performed above expectation but not noticeably high on the charts and Gamer was a flop, but with another RomCom alongside Jennifer Anniston this spring, he’s officially a household name. 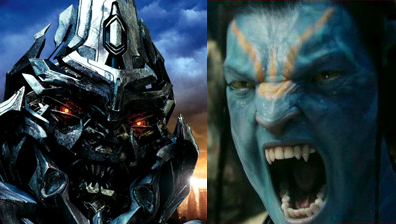 The biggest moneymakers of 2009, Transformers: Revenge of the Fallen and likely Avatar, encapsulate the critical battle of the decade at the movies. When Avatar ultimately surpasses Harry Potter and the Half-Blood Prince for the No. 2 grossing film of the year, we’ll have quite the symbolic battle on our hands. The gigantic clunking titan of loud, big budget, big special effects sequels based on old material (Transformers: Revenge of the Fallen) and the ground-breaking, original, intelligent blockbuster (Avatar) represent two opposing forces in film production. Now we all know who wins this battle in quality, no doubt about that, but this is a battle over what we’ll see in the future. James Cameron is our John Connor, leading the resistance of creative filmmaking against the corporate juggernaut that wants reliable moneymakers. Both saw (or will see) incredible dollars at the box office, but will Avatar be a fluke, or actually help challenge the status quo in Hollywood? It pains me to know that the answer will be the former, not the latter, but I can still rant about it. Although Americans were great this year about giving their dollars to quality films such as Up, Avatar and The Blind Side, there was still way too much going to Transformers 2, New Moon, G.I. Joe and Paul Blart: Mall Cop (yes, the 17th highest grossing film of 2009). I know it’s hard. Transformers was good, so even though critics ripped the sequel as much as possible, we all had to go see it anyway. And even though Twilight sucked, New Moon might’ve been better, we had to go, and we had to see how they did it. But we don’t. If we let go of that notion of curiosity over book adaptations seeing what happens next in sequels, we can cut down on the amount of crap being made or at least start to see more effort by studios to make a quality product out of a pure money ploy. We live in an age where stuff comes out five months later on DVD, so if the curiosity is that bad, wait. Make your statement – don’t see things unless you’ve been recommended or the reviews have been positive – let Hollywood know you don’t want to pay $10 for crap. 2009 has made this a fight with original films and careful adaptations like Star Trek, Avatar, District 9, Up, The Hangover, Taken, (500) Days of Summer and Inglourious Basterds. Hopefully it’s close enough to giving originality a permanent edge over dependability. With that, we welcome in 2010 and a promising new slate of movies to get excited about. Happy New Year!